Something about this dish seems like it should be served in a higher end sports pub, if such a thing exists. Share with a date, family, friends, or just yourself. Everyone will enjoy! • Cut 1 pound whitefish into 2-3 inch strips and place in pan. Drizzle over ¼ cup olive oil and turn heat on to high. Once starting to brown, remove from heat and cover. • Make panade base: 1/3 pound butter melted in pot. Add ¾ cup flour and stir to combine. Add ¼ cup sliced jamón serrano and continue to stir until smells slightly nutty. Add 1 cup milk in three stages, mixing thoroughly each time to combine. Add ½ teaspoon grated nutmeg, zest of half an orange, and a large pinch of chili flakes. Season with ½ teaspoon salt. • Add cooked fish into mixture and stir to break up fish and combine until you have consistency of mashed potatoes. • Form the fish mixture into small logs, the size of a neck of a beer bottle. • Bread the croquettas in the following order: flour, then egg + milk whisked together, then panko bread crumbs. • Fill a pot or pan with at least 1 ½ inches canola oil. Heat oil until approx. 375 degrees, or until there is a sizzle when croquettas are dropped in. 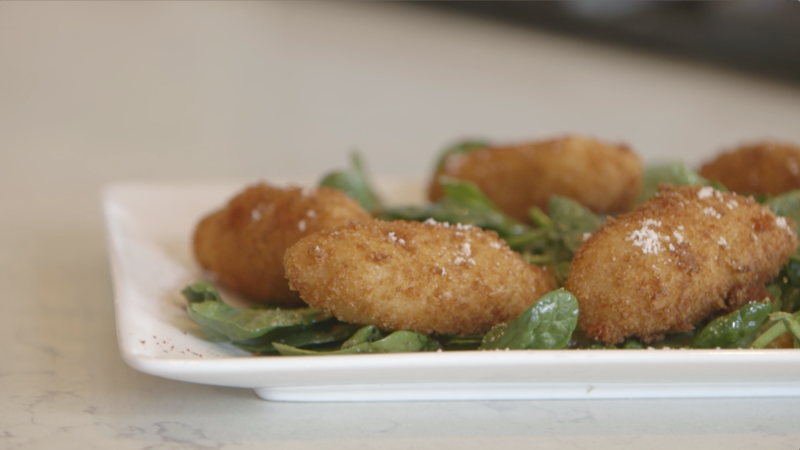 Place all croquettas into oil and cook about 2 minutes until golden. Remove from oil onto paper towel and sprinkle with pinch of salt to finish. • Salad: 2 cups spinach, 1 orange sliced into rounds, and dress with sherry vinegar, orange juice and olive oil. • Plate with salad on bottom, croquettas over top and smoked paprika dusted overtop.